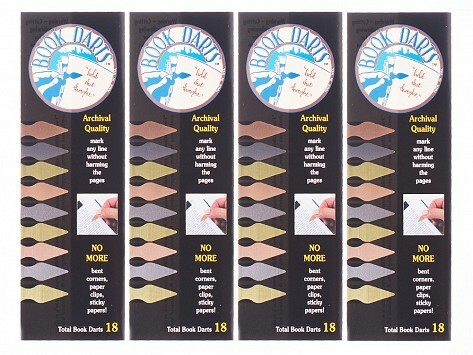 Book Darts are precision-cut, paper-thin metal line markers that attach easily to any page and won't leave a lasting mark. Dimensions: 8.5" x 2" x 0.10"
I have this habit of reading about three books at a time, especially if they have competing themes. Your usual bookmarks not only are clumsy but leave you with a marked page. Book Darts let you mark page and line where you left off, and they are completely unobtrusive. Wouldn't trade the world for them. This was a gift and it was successful in not marring up a book! Hooray! Happy to support a "local" these are terrific for the text books or other reads! Thank you! These are super handy! I like that I can mark the places without marking the page up in any permanent way! Former high school teacher Bob Williams and his wife Jeanette created Book Darts to enable students and booklovers to mark their pages and notable passages without leaving a lasting mark. With Book Darts, you can quickly and easily note and relocate meaningful lines of text for future reference and discussion on books both borrowed and owned. Unlike paper clips that leave a dent and sticky notes that can be an eyesore, Book Darts are safe, easy to use, and aesthetically pleasing. 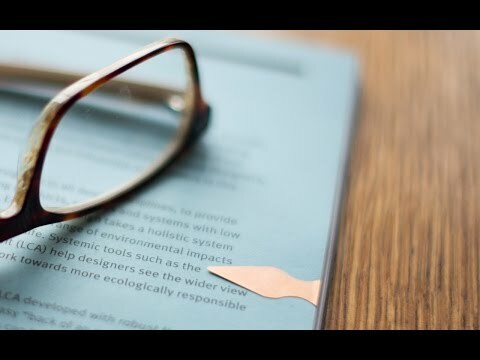 An elegant alternative to highlighting, underlining, and folding page corners, these precision-cut, paper thin, metal line markers are just the thing for students who need to keep their books in good condition for re-use or resale. One tester found Book Darts especially useful for tagging recipes in her cookbooks. Made in the USA and packaged in a gift-ready tin, Book Darts let bookworms both mark and preserve the beauty of the written word.